Hello. I would like translate: ookiku furikabutte, in spanish, can i? Thank you. I hope your answer. 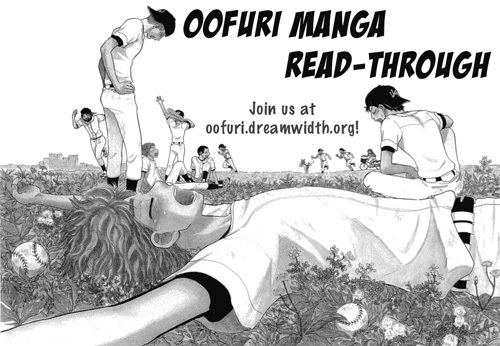 Second, we're organizing a communal read-through/re-read of the manga on the Dreamwidth comm! So I am here to cross-promote that. We'll be doing one volume every two weeks. Community members can sign up to host a volume and will make posts containing plot summaries, screencaps, trivia, translation issues, cultural tidbits, or anything else they care to include. Then all community members will be welcome to read along and join in discussion by sharing their own thoughts in the comments. Or if people just want to follow along silently, that's cool too! If you'd like to sign up to host a volume, many are still available, and sign-ups are here! Right now we're taking sign-ups for the first 10 volumes. You can also sign up in pairs/groups or split up one volume into several chapters for people to host if you'd like. You don't need a Dreamwidth account to participate in the read-through, and are welcome to comment anonymously or signed in through OpenID using your LiveJournal account, but if you would like to host a volume you'll need a Dreamwidth account. This is a small Q&A corner to Oofuri author Higuchi Asa that was published in Afternoon together with chapter 100 as celebration. A gazillion thanks to herongale for these scans!! aflyingteapot has done a summary translation for chapter 101 and it is posted on my Dreamwidth here! We're looking for translators for the next few chapters (ch94 and onwards). Our current translator is very busy at the moment so if you're willing to help, just send me a message or a comment below. Thank you! To conform with the community rules, I'll be locking the previous download posts to members-only. In the future, I'll leave the latest post public then lock it as soon the next release comes. Those who don't wish to have an account can still access the dl links in my journal. Hi! aflyingteapot said I could post this here. :3 I am pretty new to Oofuri fandom and wanted to try meeting more people, so I thought I'd make a friending meme for everyone! Gosh it as been forever and a day! Sorry about the wait guys. m(_ _)m Issues on both RS's end and mine (mostly mine methinks ^_^;) made this slow in coming, but here it is! If anyone was wondering at the stall in the summary/script translations of the more recent chapters as well and hadn't popped their head into my journal to check what's up, the start of grad school and other Things About Life put pretty much next to everything I do to a screeching halt. I'm feeling a little more adjusted and freer now and maybe able to pick some things back up again...but I also seem to be saying that every few weeks or so and, well, you can see how much translating that's helped me get done the last few months ^_^; But here's hoping, and also hoping that everyone can keep a place in their heart for our boys, because one pace or another, I'll keep up my translations when I can!